You are here: Home / Home Improvement / What carpet is best for stairs? 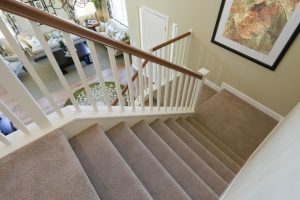 Stairs are the most common place to add carpeting, but choosing the right type of carpeting for your stairs is key to ensuring its durability and to reducing maintenance costs. Here are a few areas to consider when selecting carpeting for your stairs. Carpet quality – Your stairs will have a lot of traffic as they will be in constant use. Therefore, it is best to use the highest quality carpeting you can afford, as it will end up lasting you a lot longer. Durability – Look for carpeting that is made for stairs and those that provide sufficient padding. Thickness – Ensure that your carpet is the right thickness, as a carpet that is too thick can be a safety hazard. When a carpet is too thick, it can leave the foot with less support, causing slips, and falls. Plus, you will find that carpet installers will not like to work with thick carpets on stairs, as it can be difficult to wrap the mat on the stairs. Look at a carpet with a pile height of 1/2 inch or less and a carpet padding of 7/16 inch or less with a pile density rating of at least 8 pounds. Soil resistance – Stain resistance is not that important as your carpet will not get too many spills. However soil resistance is essential especially if your stairs are very close to an outdoor entrance. To reduce residue, look at placing a mat to remind family and guests to clean their feet before they come into your home. You could also ask people to remove all footwear before they enter your home.